This necklace is of Good Quality Stainless Steel with highly polished shine. 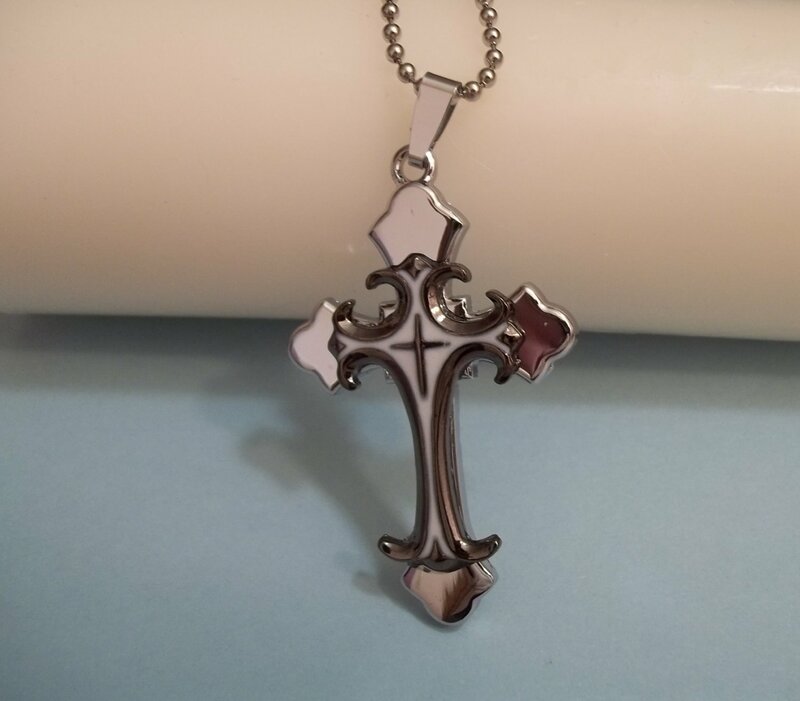 The pendant is a very ornate cross with highlights of silver and white. Very eye catching and appealing. Comes with 24 inch stainless steel ball chain which can be easily cut to adjust to a desired length. Would make a beautiful gift for any occasion. Stainless steel jewelry doesn't tarnish and is very durable. Pendant Size - 57mm x 35mm approximately- 2.25" X 1.5"
Item is shipped within three business days of payment approval. Please allow ample shipping time depending on the item destination.Your patience with the shipping process is appreciated:)Also see our FAQ section for more information regarding shipping. If you have ANY problems, concerns or questions please don't hesitate to contact us for a prompt response. Once the item has arrived we would appreciate Your feedback and rating. Before leaving negative or neutral feedback please contact us. FEEL FREE TO CHECK OUT OUR STORE AND HAPPY SHOPPING!